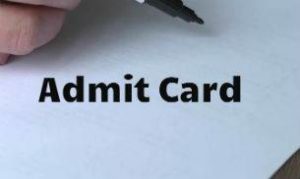 CGPSC SSE Admit Card 2019 Out!! Prelims Exam Date OUT !! The Chhattisgarh State Service Hall Ticket release date can be known from psc.cg.gov.in. Download CGPSC SSE Admit Card to write the State Services Prelims Examination which will be on 17th February 2019. CGPSC SSE Admit Card 2019. Stay tuned to this page for the direct admit card download link. CGPSC SSE Admit Card 2019 Released !!! Latest Update (08th February 2019): CGPSC SSE Admit Card 2019 Released!!!. Check all the required Information end of this Page. Download CGPSC SSE Mains Exam Admit Card in pdf format using the links available at the end of this page. The Chhattisgarh Public Service Commission notified about the recruitment of 160 state services post like CG Subordinate Account Service, Naib Tehsildar, Cooperative Extension Officer, Commercial Tax inspector etc. Likewise in the name of State service Exam, it is employing the new candidates for the 160 state civil services posts which are mentioned above. So in that process, CGPSC SSE Exam Date is the crucial phase of the selection process. An entry document is required to inform the exam instructors that he/she is accepted to participate in the CGPSC SSE Selection process. Get to know the about the Chhattisgarh Sarkari Jobs here. CGPSC SSE Hall Ticket 2019 availability can be tracked with the information provided in this site. The post names that will be employed on the basis of performance of the candidates in the selection process of CGPSC are Accounts Officer, District Registrar, Asst Director, Assistant Director, District Excise officer, Assistant Director (Social Welfare Dept), Assistant Project Officer, Finance & Planning Department, Child Development Project Officer, Assistant Superintendent, Naib/Nayab Tehsildar, Excise Sub Inspector , Commercial Tax Inspector, Sub Registrar, Cooperative Inspector, Assistant jail Superintendent. The CGPSC SSE Mains Exam dates are 21st to 24th June 2019. By taking their educational background and marks in the SSE mains exam, in the respective post, they will be posted. Now the mains hall ticket of CGPSC SSE will be provided first during the first week of June 2018. Later in June 2018, CGPSC SSE admits card 2019 is open. Check out latest employment news updates here. Through the formal site of this State service Exam, the applicants can know the CGPSC SSE Admit Card. Another good alternative to the main site is this page. At this place, the updates of CGPSC SSE Admit Card 2018 are posted. Earlier only, the prelims and mains dates have been scheduled on the dates for prelims, later prelims results are released, for the merit list of candidates in prelims, mains exam will be given soon. The CGPSC SSE Exam Date for both Prelims & Mains all will be given here clearly. So get the CGPSC SSE Exam Date and the links about the CGPSC SSE Admit card Here. The official link activation of the CGPSC SSE Admit [email protected] will be taken place prior to the 10-15 days of the 18th Feb 2018. Thus we can assume the date of CGPSC Mains hall ticket release should be in the first week of June 2018. The CGPSC SSE exam appearing aspirants it is good if you have the saved copy of admit card with you from the declaration time. Bring the xerox copy of it to your allotted exam center. To restrict the fake candidates in attempting this tough exam, officials using this admit card. This CGPSC SSE Mains call letter has the applied candidate photo, signature, name, exam name and many other. If photo and signature are present, then fake candidates can be identified very easily through biometric verification. So for bi-metric verification purpose, reach the exam center 30 minutes before the given time. Carry the CGPSC SSE Call Letter to the Exam Hall. don’t forget to carry the CGPSC SSE Admit card and any ID Proof to the Exam. CGPSC SSE Admit Card 2019 Links DOWNLOAD HERE NEW!!! !